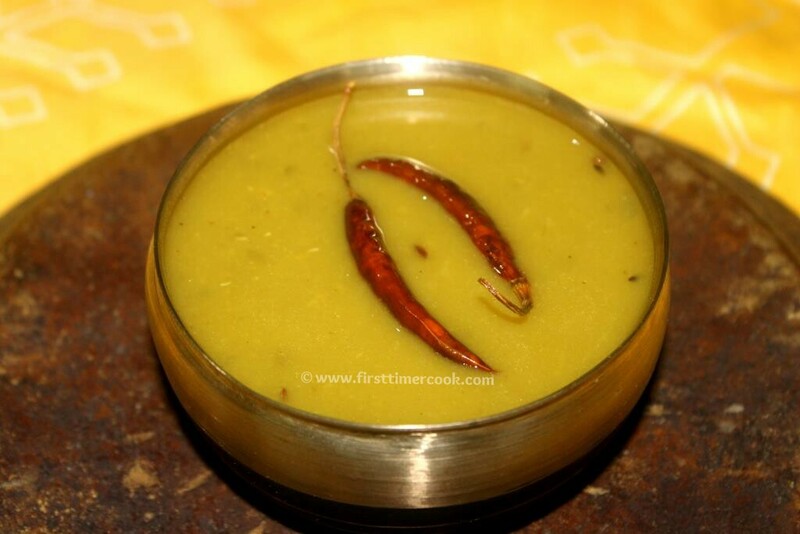 Add 1 cup of water, turmeric powder and washed moong dal in a stainless steel vessel and cook till the dal turns soft. Alternatively, just pressure cook upto 2 whistles. Once the dal is cooked, add 1 & 1/2 cups of water, salt. Bring to a boil and then simmer. While the dal is simmering, prepare the tadka. Heat ghee / oil in a pan. Add mustard seeds and allow to splutter. Add cumin seeds and once they turn brown, add the asafoetida and red chili powder and mix. Add the chopped tomatoes and cook for 4 minutes / till they turn soft. Add this mixture along with jaggery to the simmering dal and cook on medium flame for another 4-5 minutes and turn off flame. Remove to a serving bowl and serve !